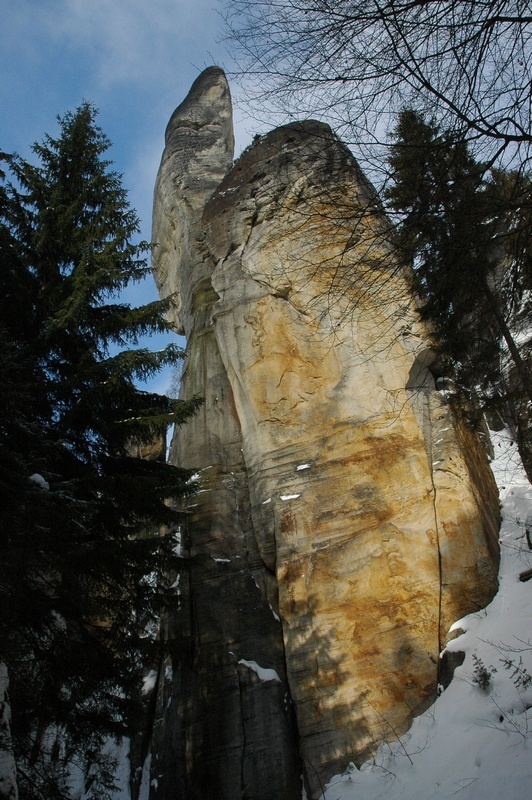 The Adrspach Rocks (Adršpašské skály) along with the neighbouring Teplice Rocks Area forms the most distinguished sandstone plateau in the Police Basin in the Broumov Highlands. Todays, both the rock towns with the area of 4,456 acres rank among the largest natural reservation in the Czech Republic. It was declared national monument as early as 1933. 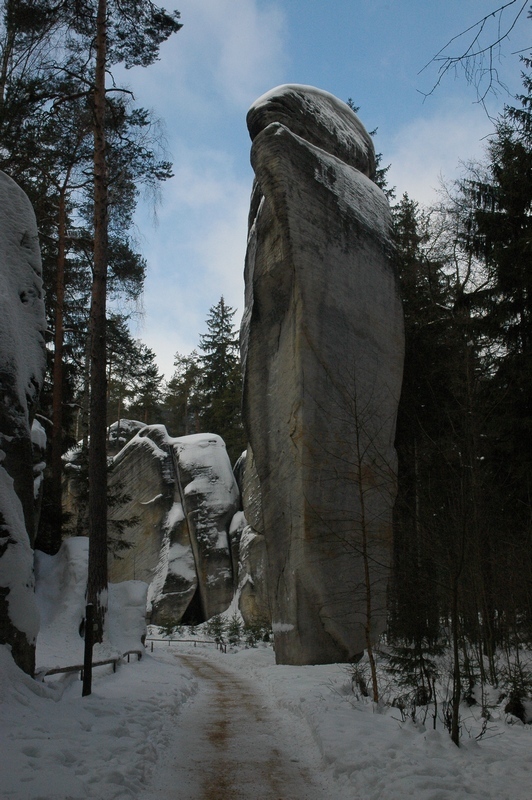 Compared to the rock town of Teplice, which is constituted by distinckt rock walls, the Adrspach rocks are known for their high rock towers. In the Palaeozoic era, this area was a tectonic basin or depression formed by orogenic movements in the Earth's crust about 350 million years ago. There were numerous lakes and swamps on the floor of the depression with luxuriant vegetation. The prehistoric rivers flowing down the neighbouring mountain ranges deposited layers of mud and sand on the floor burying the plants under them. In this way, the nearby deposits of black coal were formed. In the second half of the Mesozoic era, approx. 100 million years ago, a shallow seaway spread into the interior of what we now call Central Europe. On the bottom of this sea, mighty layers of sand were deposited. Their weight and various chemical processes connected individual grains together forming sandstone rock. As the seaway transgressed (advanced inland) over the region and retreated several times, different layers of different materials were deposited again and again over the older ones. This resulted in various composition and resistance of indivi dual layers. After this area was uplifted in the Tertiary period, the sea retreated for good. The weight of the mighty layers of the hoisted and exposed sandstones broke the seafloor layers into a great number of individual blocks that eroded with time. Only the most resistant parts of what was once the seafloor, the square-shaped sandstone blocks, have persisted. Nowadays they can be seen in this region in the form of various table mountains, buttes, uplifted plateaus and rock areas. Geologic faults and cracks in this area are perpendicular to each other stretching in the NW - SE and NE - SW directions. The rockiest section of this plateau is located to the north of the Wolf's Gorge (Vlcí rokle) and includes also it short section above the Lake. The elevation differences are relatively high here ranging from 500 metres to 660 metres above sea level measuring from the lowest to the highest parts of the plateau. The highest point in this area is the Old Castle Hill (Starozámecký vrch) with its elevation of 671 metres above sea. 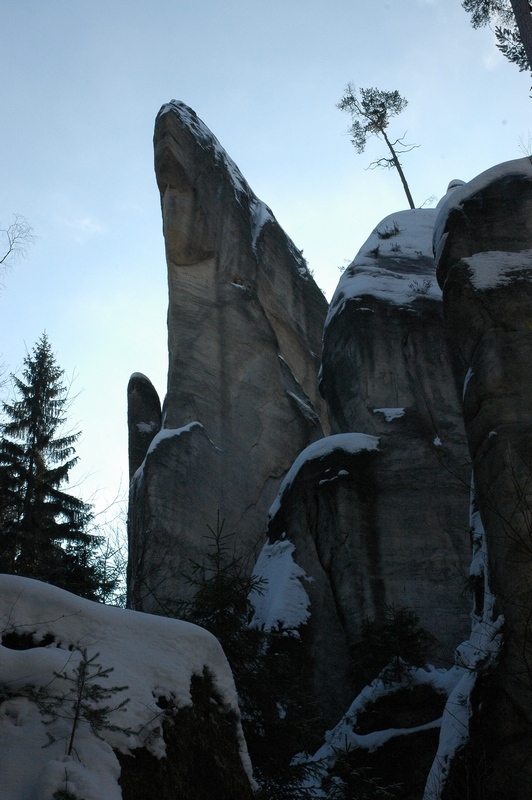 The highest rock formation is the Lovers (Milenci). The rock area is flown through by the Watercress and Rock Creeks with numerous tributaries and by the Metuje River that rises nearby. Besides, visitors to this natural reservation can find two waterfalls an artificial lake and a large lake in the place of the former sandpit. - What is the meaning of the turonian and the coniacian? 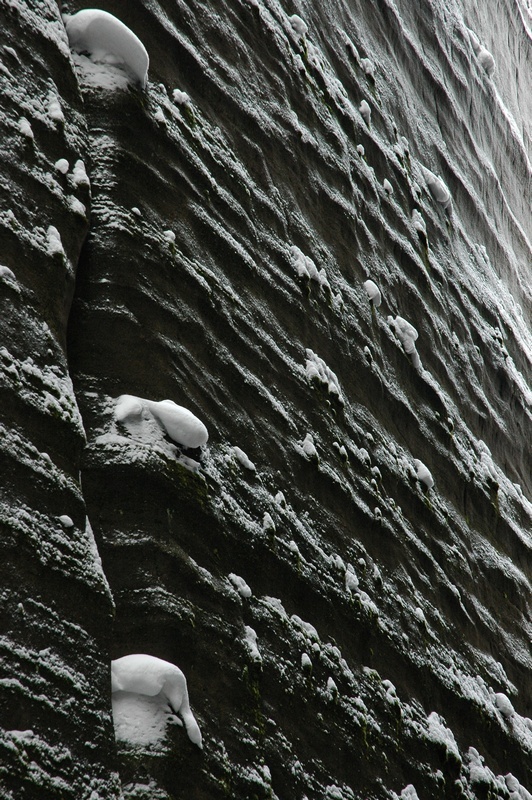 - What is a rock window (a hole in the rock)? 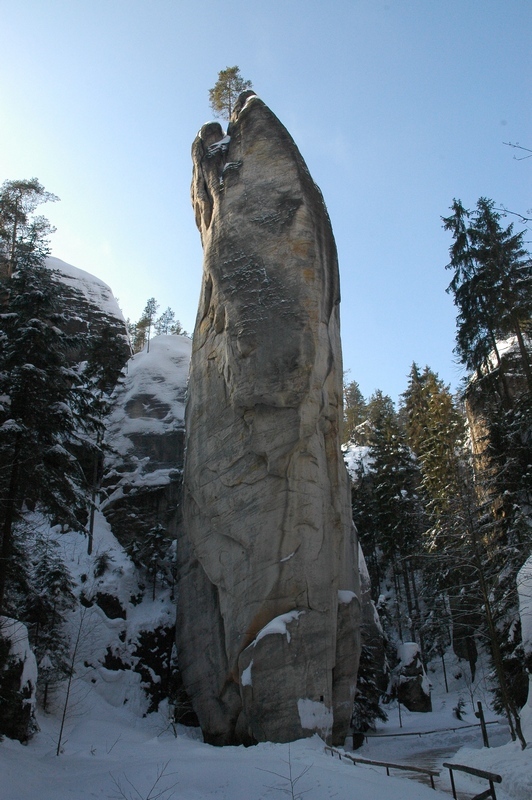 - How high is the highest rock formation - the Lovers? - How high is the line which shows the water level during a big flood in 1844? 2. Add a picture of yourself and any rock tower with window in the Adrspach. Don't wait for a confirmation of your answers. If there is something incorrect, we will contact you. Adršpašské skály tvorí spolecne se sousednimi Teplickými skalami nejvýznamnejší pískovcovou plošinu Polické pánve v Broumovské vysocine a dnes jako celek tvori nejvetší národní prírodní rezervací v Ceské republice vyhlasenou jiz v roce 1933. Narozdil od Teplickych skalnich sten jsou pro Adrspasske skaly charakteristicke vysoke skalni veze. Celá oblast Broumovska byla od prvohor tektonickou sníženinou, která vznikla horotvornými pohyby asi pred 350 miliony let. Na jejím dne se vytvorila jezera a mocály s bujným rostlinstvem. Dávné reky tekoucí z okolních hor pohrbívaly vegetaci vrstvami splaveného materiálu. Tak vznikla nedaleká ložiska cerného uhlí. V mladších druhohorách, kríde, asi pred 100 miliony let, sem proniklo melké more a na jeho dne se ukládaly mohutné vrstvy písku. Jejich vahou a chemickými procesy se volná zrna spojila v horninu zvanou pískovec. Z jílovitých sedimentu vznikly opuky. Proces poklesu a vynorování se nekolikrát opakoval a ovlivnil tak pestré složení a promenlivou odolnost vrstev. Vyzdvižením Ceského masivu v tretihorách more definitivne ustoupilo. Vlastní váha mohutných vrstev vyzdvižených pískovcu lámala do té doby vrstvy souvislého morského dna na množství ker. V trhlinách a mekcích vrstvách pusobila eroze. Nastalo zvetrávání, uvolnování a odnos materiálu. Z nekdejšího morského dna zustaly už jen nejodolnejší zbytky, kvádrové pískovce. Dnes tvorí krajinné dominanty - stolové hory, plošiny a skalní mesta. Geologické zlomy a pukliny probíhají v celé oblasti podél vzájemne kolmých smeru: SZ-JV a SV-JZ. Nejskalnatejší oblast tabule leží na sever od Vlcí rokle a zahrnuje i její krátký úsek nad jezírkem. Výškové rozdíly jsou zde velké, výtoky ze skal ústí ve výšce kolem 500m.n.m a náhorní plošiny dosahují výšky až 660m.n.m. Nejvyšším vrcholem je Starozámecký vrch s výškou 671m.n.m. Nejvyšší z kvádrových pískovcu je skalní útvar Milenci. Skalami protéká Skalní a Rerichový potok s cetnými prítoky. Nachází se zde i pramen reky Metuje. Ve skalach se nachazi take umele jeziko, dva vodopady a velké jezero které vzniklo v rozsáhlé hlubine po vyteženém písku. Vasim ukolem bude projit se skalnim mestem a na internetu i v terénu zjistit nekolik indicií. - Co je to turon a coniak? - Co je to skalni okno? - Jak vysoka je nejvyssi adrspasska skalni vez Milenci? 2. V Adrspachu se vyfotte se s libovolnou skalni vezi ve ktere je skalni okno. Poslete odpovedi na nas mail, na schvaleni odpovedi necekejte a zalogujte se. Fotku prilozte k logu.